Want to know how to frame a picture? So how do we do it? There is a bit of a science to custom picture framing – although it’s what they call a soft science. There are no hard rules like there are in physics. We specialize in framing Westcoast native art as we do a lot of custom framing for native galleries in Vancouver. 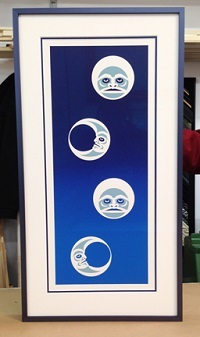 So let’s take the example of a print from The Inuit Gallery in Gastown – it’s called Winter Moons by Coast Salish artist Maynard Johnny. This is a fairly straightforward piece as there are very few colours involved -various shades of blue and the white colour of the paper it’s printed on. These are the colours we’ll be working with. It’s a process called ‘framing to the piece,’ where we use only what’s in the piece itself. This method doesn’t take into account the colour of your sofa or your hardwood floors or the paint on the wall. All of these other factors in your room can change over time so we frame to the piece so that it will work in any space. For this piece we’ll use a double mat around the image to give it more presence on the wall. For the upper mat –the one you’ll see the most of- we’ll use a white mat that matches the paper. Underneath we’ll use a blue mat to pick up on one of the blues in the image – and we’ll only show about 3/16 of an inch, or 4mm – just enough to accent the piece. The blue we chose is one called Florentine lapis which matches the darker blue in the upper half of the piece. Using a lighter coloured mat similar to the lower half of the image appears to be distracting and takes away from the print. For the frame we’ll use a narrow metal frame in a colour called cobalt blue. The thinness of the metal frame helps to accent the narrow vertical lines of this piece. A wider wooden frame in a similar colour would also work but might appear to overpower a piece this small. So there you have it. Now you know how to frame a picture. It’s not all that complicated after all. Simple colours in the artwork, simple colours in the framing. Check back later for more blog posts about custom framing tips and tricks.